You could suggest that he would use his 'smarts' to tell Superman to save the plane but really, does Superman need Batman to prompt him - like some air head muscle guy with no ability to make that connection himself? The scenes outside the airport were done during the weeks before I published the animation and feature a first look at some Super Charge custom actions (flying and holding up) that I created in Koolmoves. As I mentioned, I did actually start brainstorming for Episode 2 late last year but at the time I had a very enthusiastic co-creator feeding me ideas for Bat Storm faster than I could think of them. Somehow I got caught in a rut of trying to make those ideas fit into where I wanted to take Bat Storm and it ultimately killed my enthusiasm. I decided to put it all to one side and went on to make a successful second series of my Men In Black parody with Barack Obama and Rashy the Sock Monkey. I've been listening to a lot of Superhero podcasts of late, such as Batman on Film, Modern Myth Media and Kevin Smith's SModcast shows. Many of which are filled with discussion of the soon to be released The Dark Knight Rises movie. This, of course, has gotten my interest going again for Bat Storm. The new villain in TDKR is Bane. 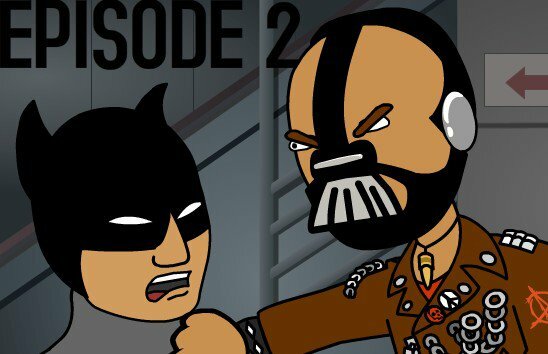 Since Bat Storm is a parody, and I had used the Joker (The Jokester) in Episode 1 I thought it would be cool to once again parody an actual villain from Nolan's movies. You can see the first image of him at the top of this article. I'm calling him Pain. Bat Storm's next villain, originally was going to be Cat Woman, for which I'd made a character for before I'd even finished Episode 1. She still may be in Episode 2 but, since I'm still writing it, I can't say for sure. As I started to write Episode 2, I came up with an opening scene with Bat Storm, like Batman, standing on the ledge of a very tall sky scraper, surveying the city. You've seen this scene in Nolan's Batman films. Batman standing on a high ledge and the camera does a kind of fly around. I wanted to see if I could recreate that in GoAnimate without going to too much effort which is how the second trailer came about. Initially the background for this scene was actual video footage of a camera panning along a city skyline but I had so much trouble with the footage not starting with the animation and not exporting with it either that I had to try something else. Then I realized I could achieve exactly the same thing just by using a photograph panorama shot and moving it and the building Bat Storm is standing on. (In case you're wondering... that's a view of Melbourne, Australia in the photo). The end result looked pretty cool. I then had the thought, how cool would it look if, after that long panning shot, Bat Storm jumped off the building? I already had the perfect jump action which I had custom made in Koolmoves back in 2011, so I tried it. It looked so good that I couldn't wait to show it to someone - hence this very short trailer. (For the record, at this stage, I haven't written any scene where Bat Storm jumps off such a high building but you never know). Regular readers of this blog will know I've been trying to teach myself how to animate with Crazy Talk Animator Pro. I've read many tutorials and watched a lot of tutorial videos and even started work on some Office People characters but haven't made an actual finished animation with it yet. I looked at my second trailer and wondered if I could recreate it using Crazy Talk? I pretty much had all the components ready made, except for the building Bat Storm is standing on. That's how my 'half a trailer' came about - since it's really just a recreation of Trailer 2 done in Crazy Talk with slight differences such as Bat Storm doesn't have crossed arms, he's standing on a different building and the colours are brighter overall. Below you can watch the Crazy Talk version of the Trailer followed by a little behind the scenes explanation of how this animation was constructed. It took me the best part of a Saturday afternoon. This particular trailer is inspiring me to give Bat Storm Episode 2 a completely different look to Episode 1. I like the cinemagraphic feel of the trailer and I'm thinking maybe using photographs for more of the sets. I'm also planning to do a lot more custom flash work, not just with actions for the main characters but also with new props as well... such as Bat Storm finally gets a vehicle to drive (but I'm not telling you what he buys with that reward money from Episode 1). My goal is to make this episode even more like a real cartoon (and possibly even a hint of a feature movie feel too). My tentative release date for the first part of Episode 2 is late August 2012. Which means I should probably get back to writing the script! You say Bane and I say Pain. I enjoyed reading this TET and the process you go through. Excited about the stuff you are experimenting with. When I read the words Vehicle, my mouth started to water. Well, not exactly, but I can't wait to see what you have in store for us. Cat woman eh? Well if she is not used in this upcoming ep. there is always the next. August.... I can wait for that. I am sure you won't disappoint. If it all goes to plan, the vehicle I mentioned should be come a very useful prop for the community. Hoping to make my custom Bat Storm character public after this too. That's great. I am still trying to picture it in my mind. I like that... I like the creativity... I like the effort, of the commitment of the artist presenting novelties... Something that surprises and stimulates the beginners. Well! It's my way, too. This is really cool and hilarious! Haha.. Characters are all serious while I'm bursting of laughter about the scene. Especially about the plane and the pilot! Can't wait to see the whole episode of your animation.